Michael Smith Engineers have introduced new Totally Closed Fan Cooled (TEFC) IP55 motor options for their range of Finish Thompson drum and barrel emptying pumps. Pumping specialists, Michael Smith Engineers, have introduced new Totally Closed Fan Cooled (TEFC) IP55 motor options for their range of Finish Thompson drum and barrel emptying pumps. This type of pump is designed to transfer a wide range of fluids from container-to-container and the new motor options extend their capability to even more applications. The new motors include a powerful 1000Watt continuous duty universal motor providing 0-12,000 rpm variable speed operation. The variable speed TEFC versions feature solid state control with a chemical resistant touch pad for precise fluid dispensing and superior motor protection against overload and over temperature. Both the fixed speed and variable speed versions are available for the PF series of drum pumps as well as for the TB, TT and HVDP drum pumps and the TM drum mixer unit. Connection of the motor to the drum pump is quick and simple without the need for tools, because of its collet design, while a threaded connection option is available for the HVDP Series. 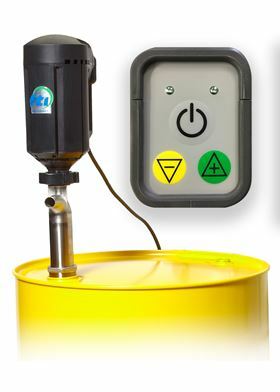 For more challenging environments the motor’s IP55 design ensures superior protection in corrosive, damp or dirty environments and downdraft cooling directs corrosive vapours away from the motor.